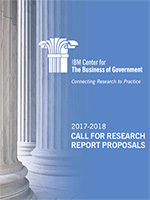 In 2018, the IBM Center for The Business of Government will mark our twentieth year of connecting research to practice in helping to improve government. These seven themes draw on significant insights shared during a research roundtable in Spring 2017 that brought together government, academic, and nonprofit leaders to identify key drivers for transforming government. Through research into these areas, the Center will continue to help communicate what leading experts know about effective practices and lessons learned to government leaders and stakeholders. Governments in the U.S. and across the world will continue to focus on controlling costs while improving the performance of their operations. A key challenge facing government executives will be to transform their organizations in an environment of constrained resources. Driving meaningful and sustained change in government requires innovative, effective and efficient decision making and implementation for positive, significant and lasting results. We again look forward to receiving proposals that address these imperatives, and continuing to work with the world’s leading public management researchers. Our next deadlines are October 2, 2017, April 2, 2018, and October 1, 2018.